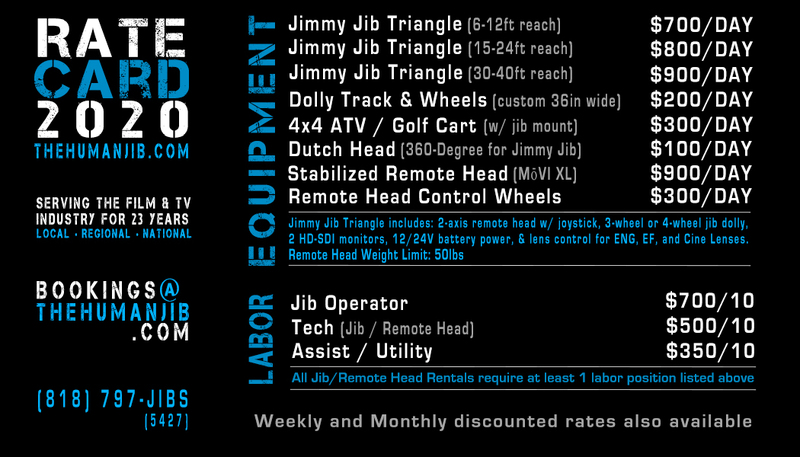 JIB SPECS Our Jimmy Jibs can be assembled in multiple configurations. Each configuration comes complete with the remote head system, controllers, HD video monitor, remote lens control for almost any lens (ENG, LANC, EF, and PL / Cine), and a remote follow-focus. We can also provide custom jib dolly tracks, custom dollies (studio and off-road), and custom mounts (for vehicles and truss). 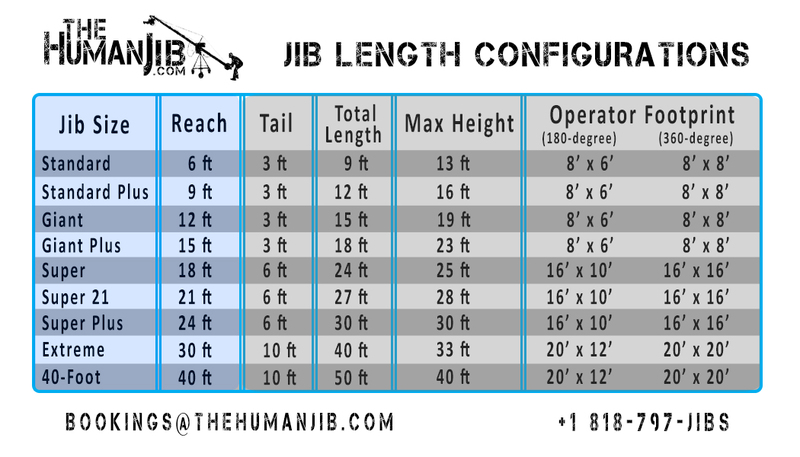 Our jib sizes are listed below. CAMERAS AND OTHER GEAR We have great relationships with gear suppliers around the country. If you would like us to organize a camera or equipment rental, just ask. To prevent injury and misuse of or damage to any equipment, The Human Jib must provide an Operator or Tech for all Vehicle, Jib, and MōVI rentals. Rare exceptions may apply. Contact us if you have any questions. Some jobs may require a Jib Assist in addition to an Operator. LOCAL LABOR The Human Jib, Inc. is headquartered in Austin, TX, with regional offices in Phoenix, Las Vegas, and Los Angeles. Additionally, we have jibs and local crews all throughout the US, so you can be confident that your costs and quality of service will stay consistent from coast to coast. Contact us to discuss availability based on the needs of your show.